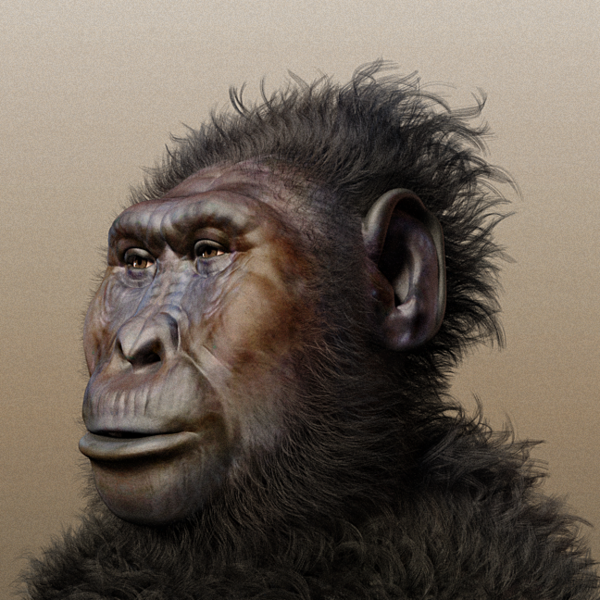 Visualizing the evolution of our bodies from our chimp ancestors to what we see in the mirror does not come easily. But Daniel E. Lieberman’s The Story of the Human Body: Evolution, Health, and Disease is a fine time machine. It took me back six million years to changes in our feet, legs, arms, head and torso, all molded as our ancestors searched for food. Human evolution can be said to have begun when one of our ancestors developed a feature that is still unique to us: We walk on two legs. That ability separated us from our cousin chimps between six and seven million years ago. We remain the only two-footed walking animal that doesn’t carry the feathers of a bird or the tail of a kangaroo. Why walk? We began walking when the fruit that we ate became sparser. The African continent was cooling and the forests were shrinking. (I’ve conflated the species that Lieberman names to “us.”) Those who could stand upright and walk distances on two feet found not only more fruit but also edible stems and leaves. We were chimp-size, but as bi-pedal walkers our arms and hands became free for new uses. The transition continued. 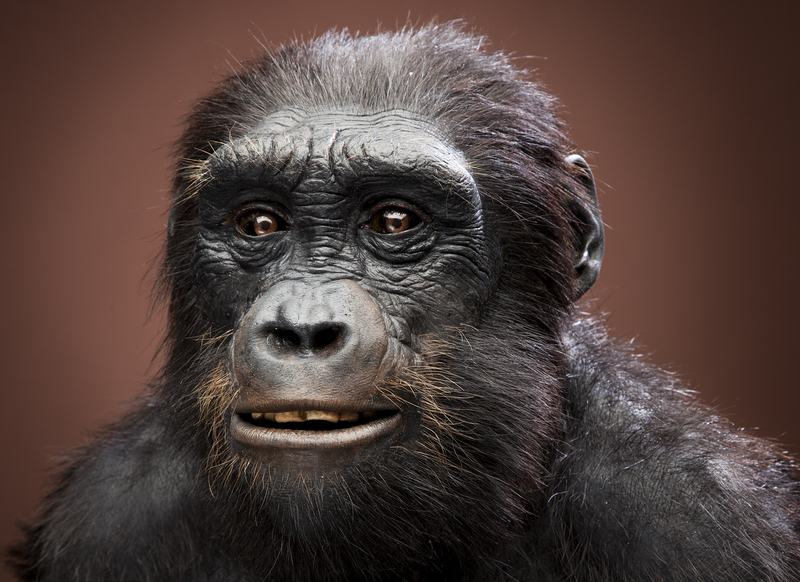 By four million years ago, our anatomy had changed again. Foraging over distances fostered “more habitual and efficient long-distance walking.” Our feet acquired an arch that put a spring in our step and pushed the body forward. For stronger chewing, molars and jaws became much larger than ours today. 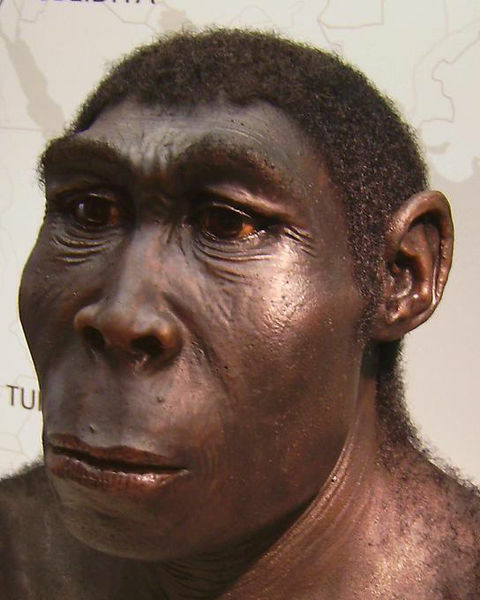 These ancestors are nicknamed “Nutcracker Man.” We were still small but more upright, still with relatively long arms and short legs. Lieberman continues the story of our evolution into the present and discusses its relevance to disease. After millions of years of seeking food and storing its energy in our bodies whenever we could find it, today we eat more calories than we need while we burn off fewer calories than ever before. As a result we suffer from “mismatch diseases” like diabetes and conditions like hardening of the arteries that our ancestors never worried about. We may treat the symptoms successfully, but given evolution’s slow clock, we won’t be adapting to resist them any time soon. But we are always walking. We walked our way into becoming human, we walked our way around the world and into history, we speak of journeys, progress, protest marches. There is little else we do that is more essentially us. 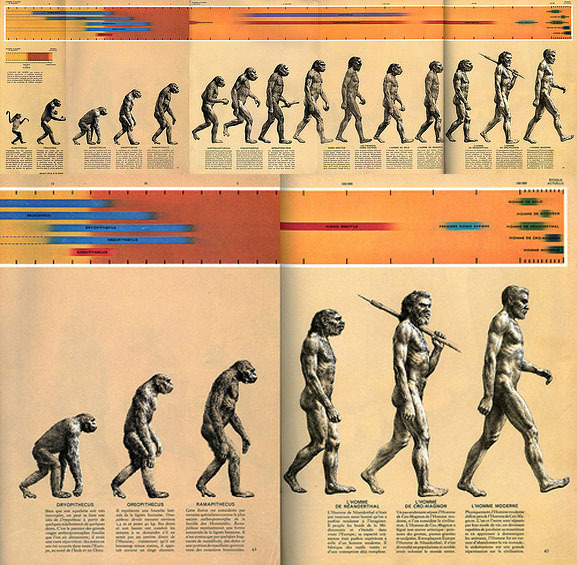 The original version of the “March of Progress,” from Time magazine in 1965. The details are out of date now but the image remains indelible. The word breath most often refers to the air we pull in to and pump out of our lungs (or to the action of doing so) as in “Take a deep breath.” But we also give the same word loftier qualities in phrases such as “the breath of life” and in practices like yoga that view the breath as a source of health and peace. Other traditions and languages also have words for breath in both these ordinary and spiritual senses, such as Latin spiritus, Hebrew ruach, and Chinese qi. But what about the breathing body itself? Unless we are wheezing or short of breath, we usually take the smooth coordination of our lungs, diaphragm, membranes, and blood cells as unremarkable. But let’s refocus our wonderment for a moment. The air is, when you come down to it, just a mix of gasses, but our body’s ingenious respiration of those gasses is a process to appreciate. We breathe in air because it contains one gas that we must have: oxygen. We know that. Less familiar, though, is the step-down system that has evolved to make the most of the fact that, like all gasses, oxygen spreads out from wherever there is more of it to where there is less of it. Thanks to this step-down dispersal and our flowing blood, we move oxygen from the air outside of us to every cell that is waiting for it, all several trillion—that’s several 000,000,000,000—of them. Why oxygen? Its electrons are arranged in such a way that it interacts eagerly and often with other elements. It’s a potent extrovert. The body’s cells may get their nourishment from food molecules but not unless they also have oxygen handy to break those molecules down, which would be like our eating dinner without any acid in our stomach to digest it. No nourishment. Without oxygen, cells go hungry. But a little oxygen goes a long way. The numbers surprised me. Only about twenty percent of the air that we breathe is oxygen. The rest is nitrogen and a percent or two of other gasses. And of that twenty percent of oxygen that we inhale, we actually use only about a quarter of it. The rest goes out again. Our inhalation is twenty percent oxygen; we exhale fifteen percent. Once it is in our lungs, oxygen must get across the lung’s membrane to the blood stream that will move it around the body. As always, it moves to where there is less of it, so it steps down across the thin membrane to the empty hemoglobin molecules in the blood cells for the ride to the rest of the body. As this convoy of oxygenated blood flows near, say, a finger, the oxygen detaches from the hemoglobin, steps down yet again across a membrane to a cell itself, and goes to work on the food particles. In the process, extrovert that it is, oxygen combines to form unusable carbon dioxide, which crosses the cell membrane back out to some empty passing hemoglobin that just dropped off oxygen elsewhere, rides the vein back to the lungs, gets off again, and is exhaled back to the air. Like riding the bus that you took to work in the morning back home at the end of the day. I argue for the wonderment of a distribution system that pulls in air-borne oxygen in an endless rhythm, arranges for it to disperse itself across strategic membranes, loads it on to the blood for transport to a million million cells that it will help nourish, after which it returns the way it came in. Our stunning respiration makes oxygen look good—even divine.